"My wife is 7 months pregnant, and my 2-year-old son is fighting. Every day we pray to God and hope that a miracle will keep us all together, alive." Emmanuel will be 3 years old in a few months. His parents are afraid he may not live to see his 3rd birthday. They are fighting every minute to pay for his treatment. For over a month, Emmanuel had a fever in the evening. At first, Kannadasan thought it was a viral infection, but when it did not subside, he rushed to the clinic. The doctor prescribed medicines for low hemoglobin. Emmanuel began turning yellow after taking them. "We thought we gave him the wrong medicines and made it worse. I rushed him to the hospital. I do not think I could ever be prepared for what they told me. 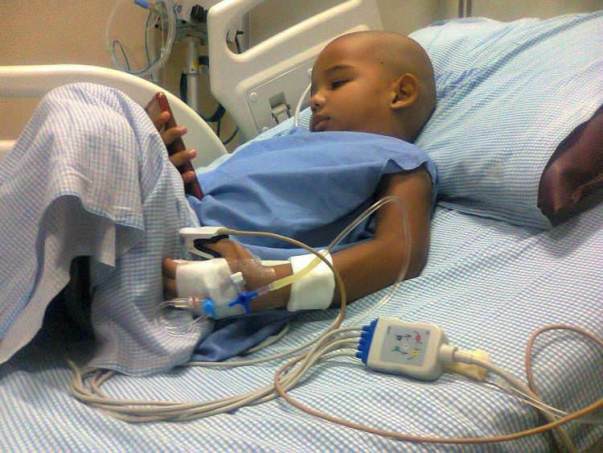 Emmanuel has blood cancer." Kavita had just entered her 3rd trimester. This news put her in shock. The anxious mother feared that her son will slip away. Kannadasan has been a rock-solid husband and father ensuring that his family's health is taken care of. "We started chemotherapy immediately for Emmanuel. I had about Rs. 4 Lakhs in savings. I took a loan from my employer. All I want is for my son to recover. Kavita's health is fine. We are constantly running around to the hospital for Emmanuel, and the focus now is to save his life." Emmanuel has Acute Lymphoblastic Leukemia. It is at a stage where continued treatment can help him beat the disease. Kannadasan is now struggling to pay for the piling hospital bills. 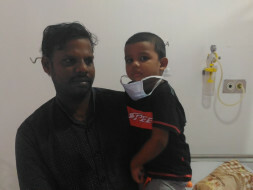 "His immunity has very low, so whenever he falls sick, we need at least Rs. 15,000 for every hospital visit. I make just Rs. 10,000/month. Yes, relatives and friends have helped, but even they have their threshold. I feel like I have hit a dead end now." Kannadasan needs Rs. 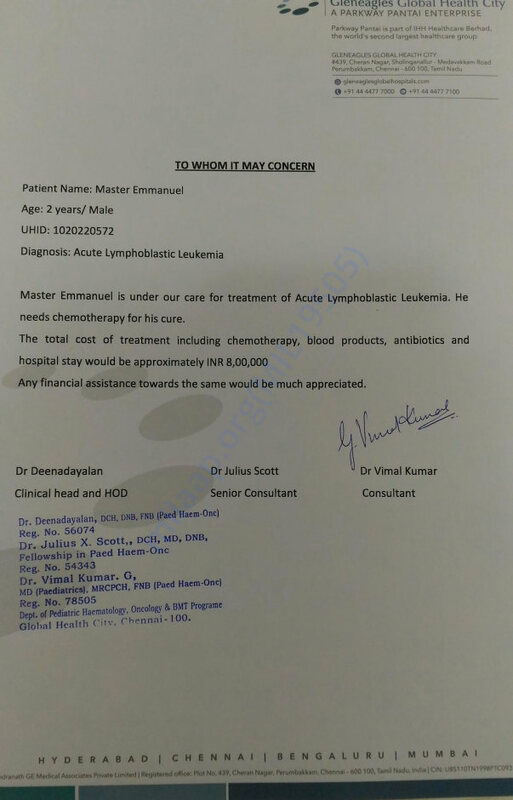 8,00,000 to complete Emmanuel's treatment. 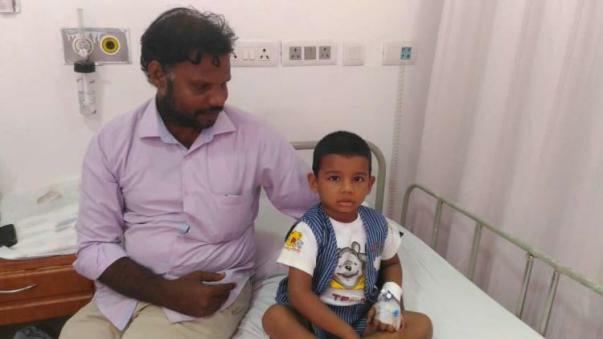 His little boy is a fighter, and will survive the disease with a little help. "The minute we take a shower and get ready he starts screaming for us not to take him to the hospital. We lie to him, distract him and take him out. The minute he sees the hospital, he thrashes around in fear. The pain is momentary. If he lives, it will all be worth. So I tell my son a white lie every now and then, just to see him live until his 3rd birthday, 4th and more to come." Your support can save 2-year-old Emmanuel's life. We have some good news to share. Emmanuel is doing well on chemotherapy, and he is currently on maintenance chemotherapy. He will have to continue it for the next 2 years and will be on regular follow up with the hospital. Family would like to thank all the donors who has donated for his cause. Please continue to pray for his health. Here's a quick update on Emmanuel's health. As of now, Emmanuel is doing well. He has been undergoing chemotherapy for a while and he's responding well. His condition is stable but the doctors have suggested that he will need further 2 years of maintenance chemotherapy to completely recover. Thank you so much for the love and support which you have shown towards him. Emmanuel is progressing well and is responding to his chemotherapy. He needs another 2 years of maintenance chemotherapy to complete his treatment. We wish to thank all the donors for your support.